Today I am excited to announce that Pine is available on the App Store for iPhone, iPad, and Apple TV. 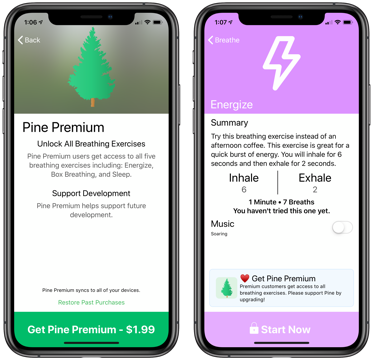 Pine is a guided breathing exercise app designed for iPhone, iPad, and Apple TV. Pine features five breathing exercises, a profile view of all of your past breathing exercise, and quotes about mediation and self-care. The five breathing exercises Pine supports are Relax, Simple, Energize, Box Breathing, and Sleep. Relax, or 4-7-8 breathing, is a popular breathing exercise that is perfect for when you begin to feel the anxiety building up during the day. Simple is a quick and easy breathing exercise to help you take a minute and collect your thoughts. Energize lets you skip your afternoon coffee for a healthier alternative. This exercise gives you a surprising amount of energy in just one minute, it’s by far my favorite. Box Breathing, improves your concentration and performance. It’s used by professionals around the world, including the U.S. Navy SEALs and professional athletes. Finally, Sleep will help you wind down after your busy day and get ready for bed. After you complete each breathing exercise you’ll see a new quote about relaxation, mediation, or self-care. I think this is a great way to end a breathing exercise and to help your prepare you for heading back out into the world. Pine is available on iPhone, iPad, and Apple TV. I wanted Pine to be on as many devices as possible at launch so that it’s available for you no matter where you are in your day. Maybe you’re drawing on your iPad, or just drove to a job interview, or about to watch TV after a long day. Pine is always there for you. I think today’s world has a lot of negativity and stress. I started making Pine back in July of 2018 for myself as a way to take a break from all of the stress we all face and reenergize. After months of development and testing, I believe I ended up making a great guide breathing app for everyone. I hope with Pine you will be able to take some breaks from your day and find joy, happiness, and calm in your life. I wanted to finish this post with a quick thank you. I’d like to thank my family and friends for your unwavering support and insight while I was developing Pine. I would not have been able to finish Pine without your support, and it would not have been the app that it is without your insight and suggestions. Thank you! Lastly, if you purchase Pine, thank you! I spent a lot of time programming, designing, and testing Pine to make sure it’s perfect for you. I hope you enjoy it and please reach out to me at casey@beansbytes.com with any feedback or suggestions. I would love to hear how it is or can help your life. You can buy Pine on the App Store today for $4.99. I also recommend following Pine on Twitter and Instagram to stay up to date with the latest updates and features. You can find Pine on both platforms by following: @Pine_Breathing. Below is a YouTube video I made to show off some of the features of Pine. Now that 2018 is over, I like to take some time and look back at what worked, kind of worked, and didn’t work in the past year. This provides insights into where I should take Bean’s Bytes into the new year and beyond. 2018 was the first year Bean’s Bytes did not have iScan for sale and instead focused solely on Step It Up. iScan was the most successful app I had ever released and the decision to remove it from sale was a difficult one. Looking at Step It Up’s numbers, I believe I made the right choice. Step It Up is designed to help users live healthier lives and feel better about themselves. From the emails I’ve received this year, it seems that I have succeeded in that regard. Additionally, in September of 2018, I launched Step It Up Plus. A new way to pay for Step It Up to unlock new features and help fund development. Step It Up Plus is on track to out gross iScan, but with only 3 months of information, it’s hard to say for certain. This is important to keep track of so I can keep making great apps. What seems clear to me, however, is Step It Up is extremely unstable on some devices and seems to be hiding bugs left & right. Therefore, in early 2019 I will begin rewriting the entire app to improve performance and fix bugs. Step It Up is 7 years old, which means there is 7-year-old code in there. After 7 years I couldn’t tell you what that code could be doing to Step It Up. I’ve learned a lot in the past seven years and Step It Up has grown a lot in that time too. I think there’s no reason in no longer making Step It Up available to users, but rather making it an app that brings you joy and just works. If you want to learn more about the coding lessons skip ahead to Technical Notes. Before rewriting Step It Up I will take some time to determine what it is users love the most, and how to make that easier to use. I think overall step counting, viewing past days activity (weeks and months as well), and tracking your weight seem to be the biggest use cases and request for improvement. This leads me to Pine. Pine is a new app I’ve been working on for a good half of 2018. Pine is a breathing and meditation app for iPhone. Lots of talk in 2018 was about how bad phones are for our health and well-being. I think this is true, but we can make our phones a tool to improve our lives. I hope with Pine users can take a minute or two every day out of their busy lives to take a breath slow down and take care of themselves. Pine will feature five breathing exercises at launch, Simple, Relax, Energize, Box Breathing, and Sleep. Each exercise has a specific purpose which is explained in the app when you select it. After you complete the breathing exercise you’re presented a screen with a quote about relaxing or taking control of our busy lives. Pine is my first Swift only app. It took me some time to learn the new syntax but once I did I realized how improved it is over Objective-C. My plan for Step It Up is to completely rewrite the app in Swift. I think this will lead to better performance and improved stability. With the old code in Step It Up, I learned that it’s important to keep track of what each line is doing. While 95% of the app I can tell you everything occurring, 5% of the code has stuff happening that I can’t entirely figure out. Rather than going through and removing or improving that 5%, I think a Swift version of Step It Up will be better. Swift lets your code be more clear and simple, and overall I think it’s more flexible to my demands. This version will crash less and more reliable. Last year was a great year, with a lot of lessons for me personally and professionally. In 2019 Bean’s Bytes will launch Pine, an app to help users take back their busy lives. It will also rewrite Step It Up to lead to a more stable and reliable version of the app. This rewrite will lead to many more years of tracking your activity with Step It Up. I look forward to hearing from you all in the new year.